These Crystal Model Sets contain different coloured jacks ( Red, Black & White ) and connectors ( long & short ) in a prescribed number to be joined together in an illustrated way to form structures like diamond, Graphite & Sodium Chloride. These crystal model sets contain different coloured jacks (red, black & white) & connectors (long & short) in a prescribed number to be joined together in an illustrated way to form structures like diamond, graphite & sodium chloride. Features: It forms structure like Diamond, Graphite & Sodium Chloride. We provide Diamond Crystal Acrylic Model for demonstrational purposes. These Crystal Model Sets contain different colored jacks (Red, Black & White) & connectors (Long & Short) in a prescribed number to be joined together in an illustrated way to form structures like Diamond, Graphite & Sodium Chloride. These Crystal Model Set contain different coloured jacks (Red, Black & White) & connectors (long & short) in a prescribed number to be joined together in an illustrated way to form structures like Diamond, Graphite & Sodium Chloride. crystal model is used in teaching crystallography to get acquainted with the morphology of crystals. To get the product ....Please feel free to contact us. 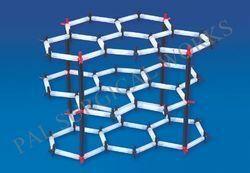 Our company is manufacturing Crystal Structure models. These models are used for study in Geography, Geology, Gemology to study the order of arrangement of atoms, ions or molecules in a crystalline material. Crystal model depict magnified version of Bravais Lattices of Lattice systems. Crystal Model sets contain different coloured jacks (Red, Black & White) . This set also contains connectors (long & short) in a prescribed number to be joined together in an illustrated way to form structures like Diamond, Graphite or Sodium Chloride. This set has an Elegant look. These Crystal Model Sets contain different coloured jacks (Red, Black & White) & connectors (Long & Short) in a prescribed number to be joined together in an illustrated way to from structure like diamond, Graphite & Sodium Chloride.